milkshake and hamburgerOrdered the Kirby Burger and Fries, food was really good.Wife orders curly fries with her burger, I order onion rings, and we share. The burgers are good, not as good as PJ's Cafe on Court street in Seguin, but no seasoning AT ALL. Thank God for condiments on the table. We had fresh, tasty burgers and fries. The salads and potatoes looked tasty also. Nice people, clean place. Definitely worth a stop! This place has been doing it right for years. Just good food. Burgers, salads, soups, you will always get fresh tasty food. Locally owned. Support local businesses! 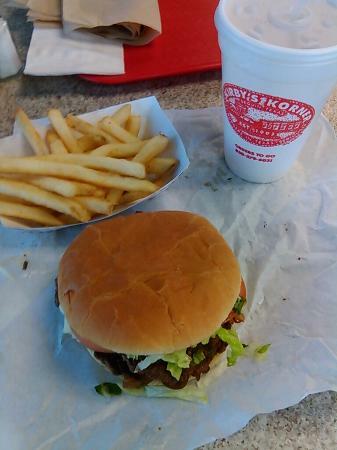 Kirby’s is a Seguin foodie landmark with great burger in a friendly environment. The hickory burger is great but sois thei Asian chicken salad. Yum! The food is always fresh and prepared to order. The burgers are delicious, chips and salsa are so good, everything tasty! The owners are great and they want to make sure that you are happy. Had lunch at Kirby's eating their No. 1 on the menu. Burger, fries and drink. Good choice as opposed to the burger chain places. Burgers, salads, apps, tea! it's all been amazing! I also like the chicken strips and the baked potatoes! Finally found a place that truly makes fresh made to order hamburgers! Even the toppings are fresh. Prices are a little higher than other places but definitely worth it. Best hamburgers ever! Also great hotdogs and other lunch and supper items. Brian and Steve are the best! Get quick answers from Kirby's Korner Restaurant staff and past visitors.